Flower Power Wedding Invitations – Early this year Bride to be Lauren got in touch with me looking for me to design her some wedding invitations and wedding stationery for her big day. 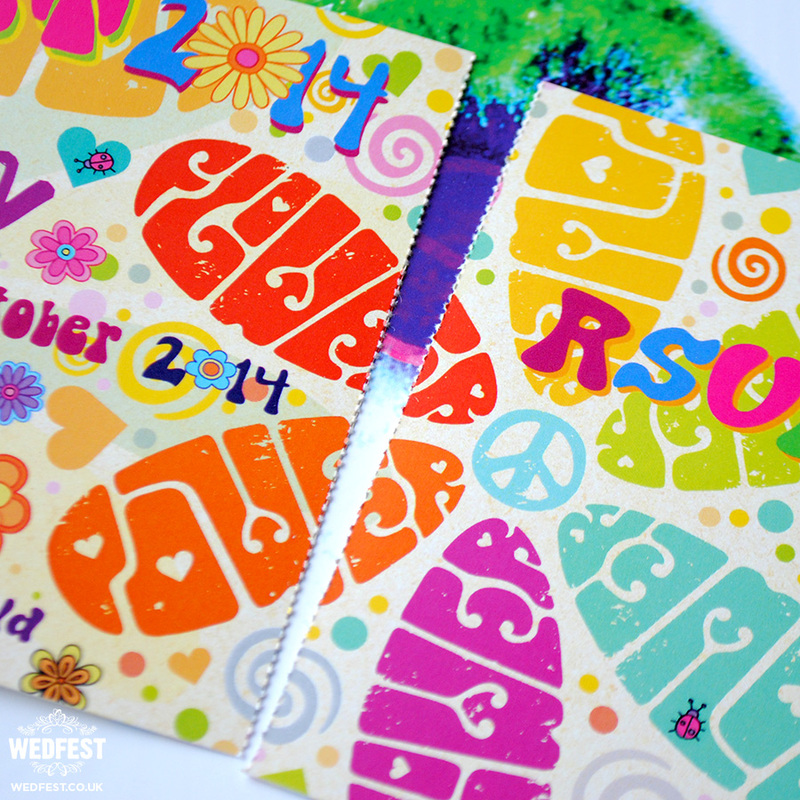 She initially found WEDFEST while searching for festival themed wedding invitations as this is what she wanted but although she was having a festival wedding it had a Flower Power theme so she got in touch and requested that I design her Flower Power Themed Wedding Invitations. 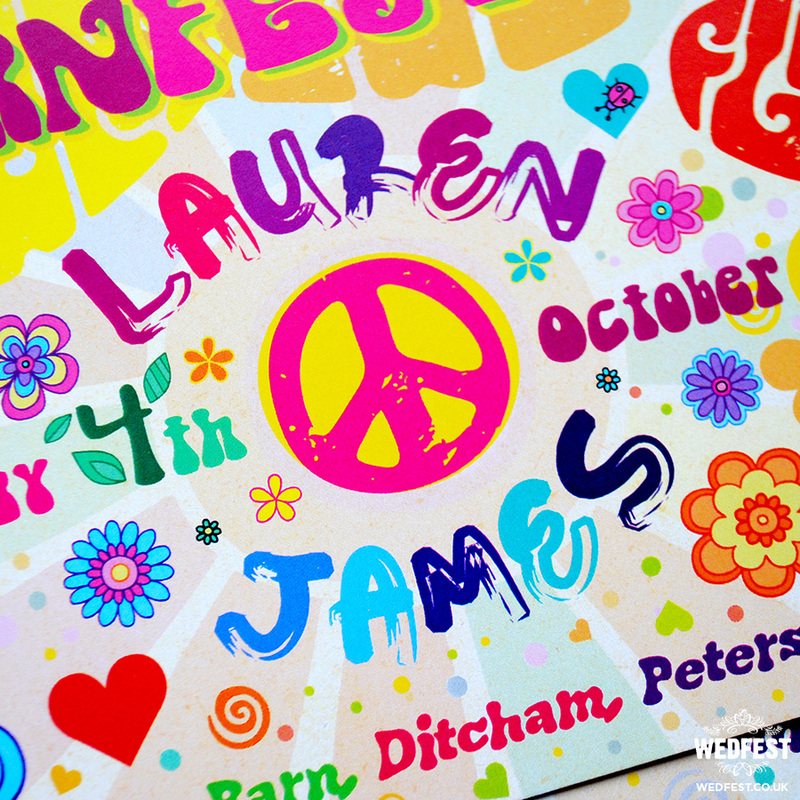 This was an exciting project to work on as I love all the flower power designs and imagery from the 60’s and 70’s and I had actually just come back from Ibiza at the time and had visited the Ibiza Hippy Markets and witnessed the anniversary of the Flower Power night which is held in Pacha Nightclub every week of the summer and each night it is held they dress up the whole of Ibiza Town in Flower Power paraphernalia and the dancers and club promoters parade through the town and all over the island of Ibiza promoting the club night. With all of this in mind I did some research on flower power design and set to work. My very first instinct was to have the couples names around the peace sign or peace badge so this was the starting point for the whole design. 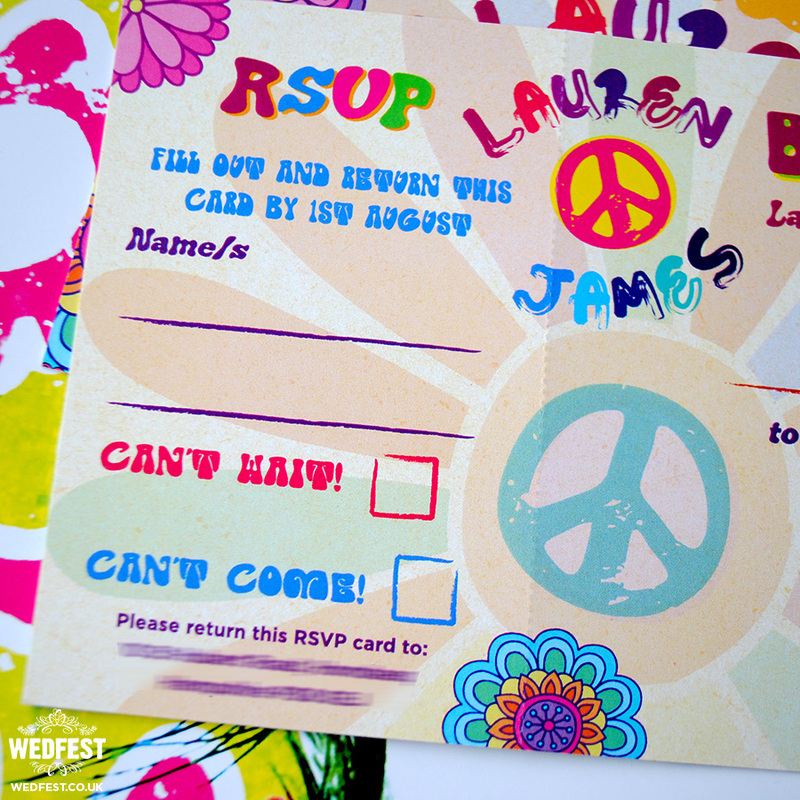 All of the fonts I used for this invitation design were all quite hippy, groovy and flower power orientated to keep with the theme. 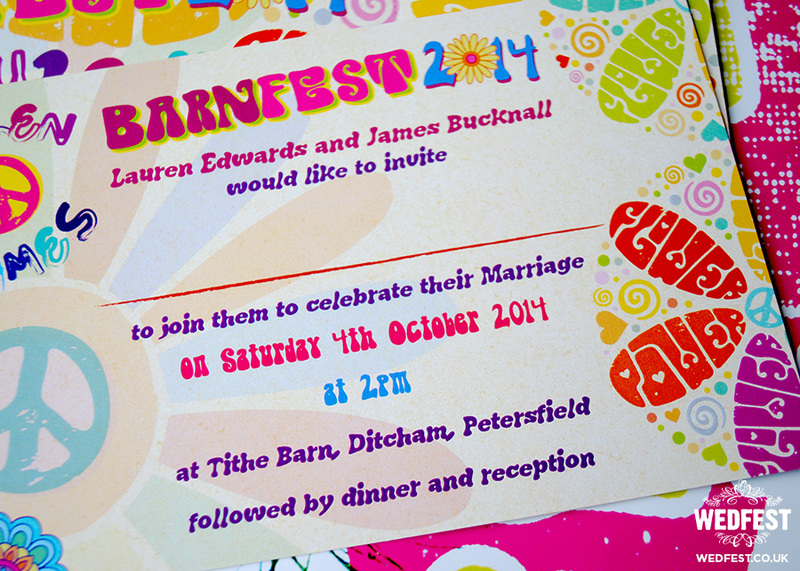 The couple were holding the wedding in a Barn called Tithe Barn in Ditcham, Petersfield so they wanted the title of the invite to read BARNFEST 2014. I replaced the zero of 2014 with a flower to further drive home the flower power design as this is often seen in designs and posters from that era. In the background on the wedding invitation design there is lots going on, flowers everywhere in all sorts of styles, colours and sizes as well as hearts, swirls, dots, sunbursts and little ladybirds crawling all around the invites. The main thing I wanted to push was lots of colour, lots of hippy themes and really make it look groovy like something straight out of the 60’s or an Austin Powers movie. On the RSVP section of the invite I had a large flower with the petals made up of the words FLOWER and POWER in the shape of petals and with the peace sign in the middle. The reverse side of the invite had more information of the wedding including an area for the names of the guests to be written and timings, locations etc. Similarly the reverse side of the RSVP cards had a space for guests to write their names and accept or decline the wedding invite. These wedding invites were made in the style of tickets with a tear off RSVP stub so that wedding guests could easily reply to the couple. 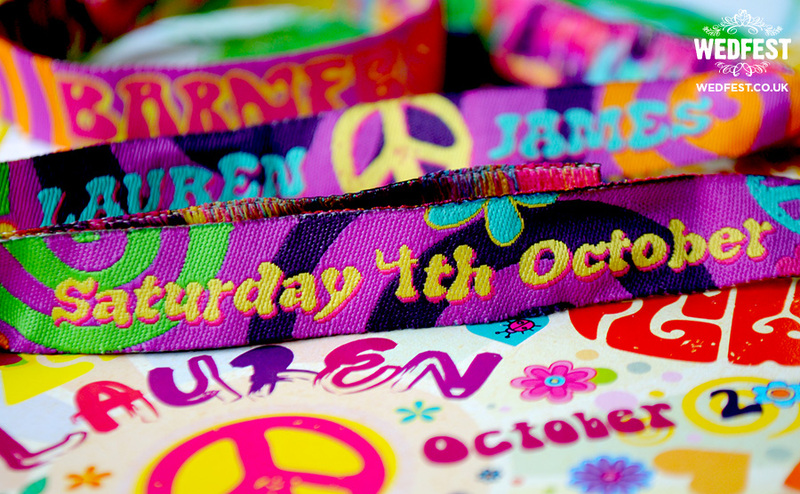 To keep with the festival theme of the wedding the couple also wanted me to make them festival style wedding wristbands for the guests. 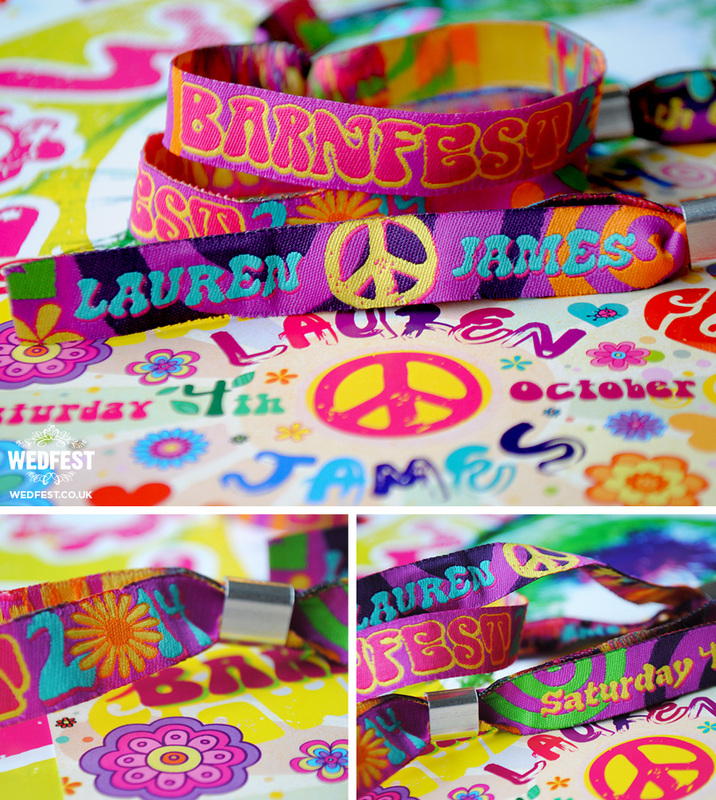 The wedding guests would each be given a woven fabric wristband to wear on the day of the wedding which would act as their ‘Festival Pass’ for the day, which is just a bit of fun but makes the guests feel even more part of an awesome and special event. For the wristbands I continued the flower power theme taking the same design elements I had used on the wedding invites and applying them to the wristbands. 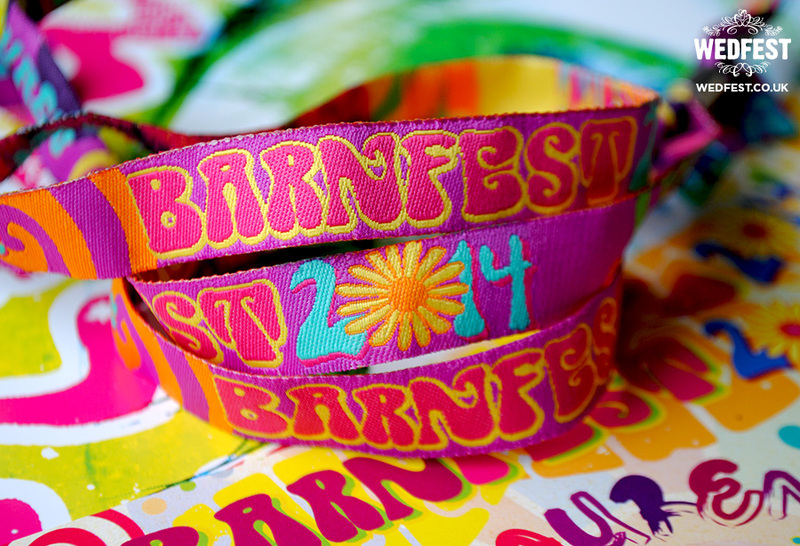 For the main body of the wristband the text BARNFEST 2014 would be on display in the same typeface and style as it was on the invitations. 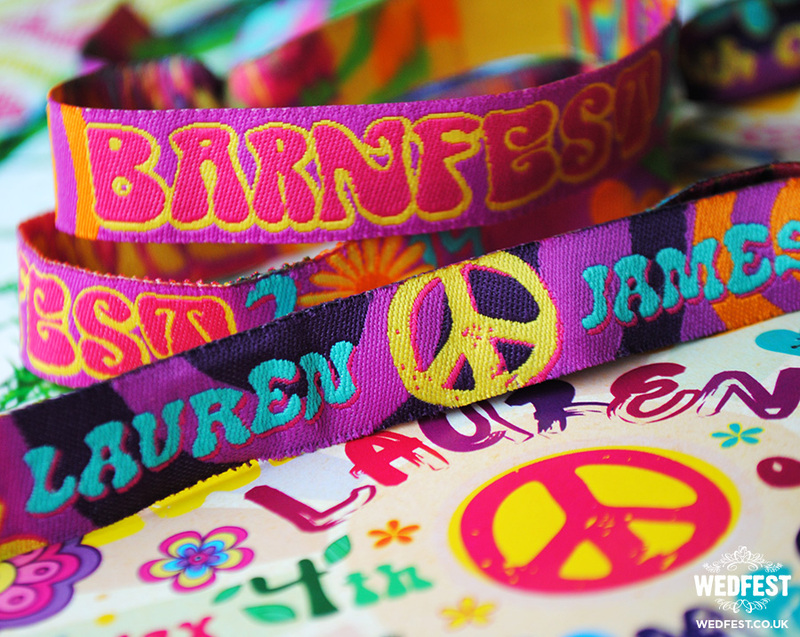 On the tails of festival wristbands I had the couples names on one side with a peace sign in between them as you can see in the photos and on the other side I had the date of the wedding. I used the same hearts, swirls and flowers that I used to design the invitations and the detailing on the wristbands is totally amazing as you can see in the photos. 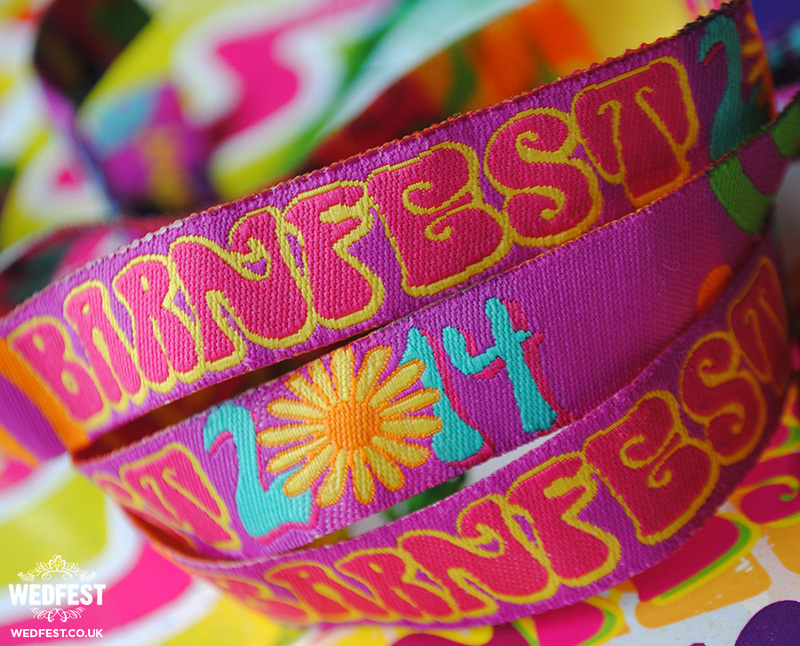 They were really bright and colourful and are probably the best festival wedding wristbands WEDFEST has made so far. 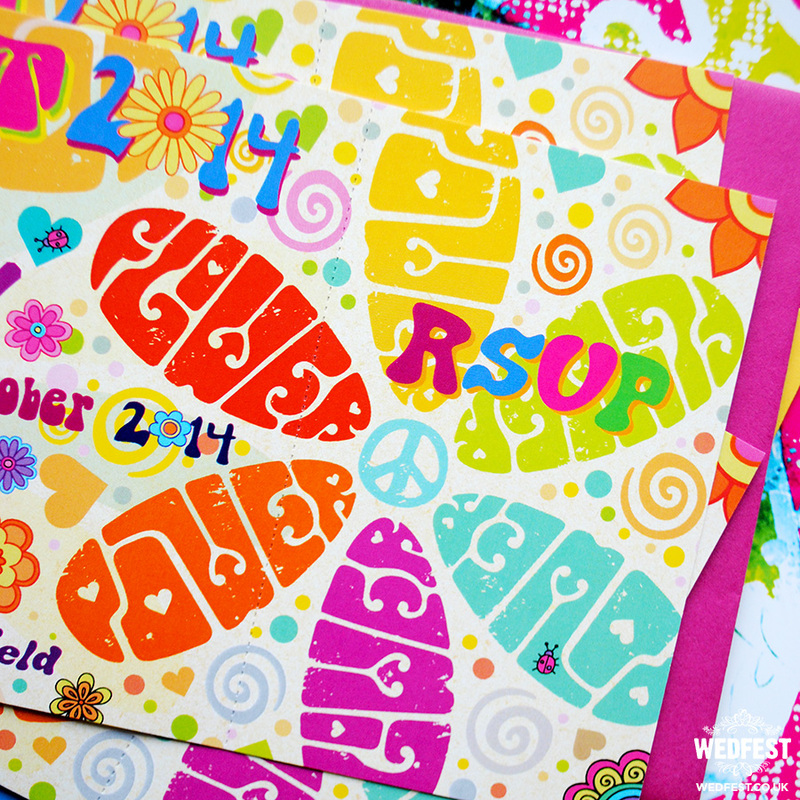 This was a really fun set of wedding stationery to work on and the couple were delighted with the outcome. 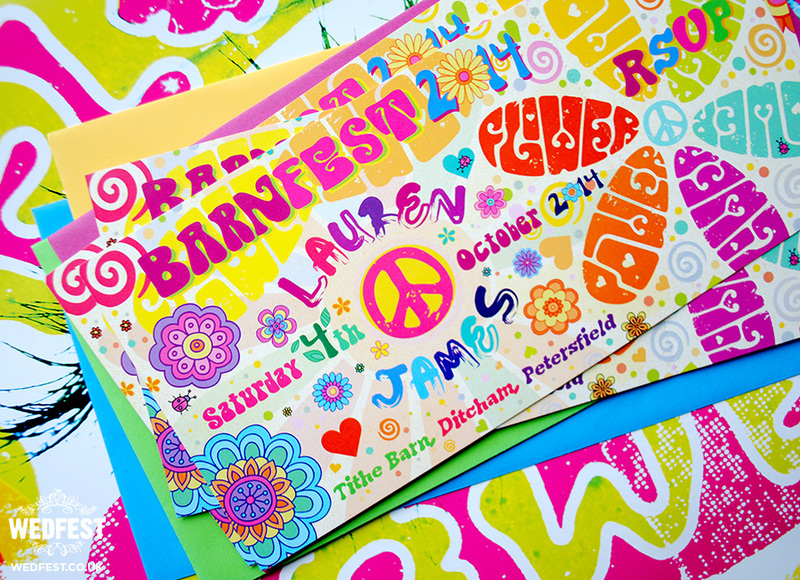 If you fancy finding out more about this awesome and unique wedding stationery or are planning a Hippie Themed Wedding of a Flower Power Wedding, or would just like more information on anything you see here please click here to get in touch.